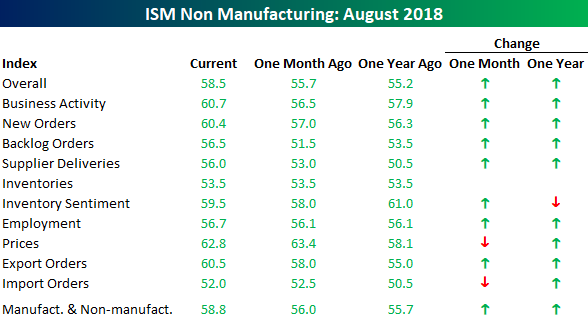 The release of the August ISM Non-Manufacturing report handily exceeded forecasts, coming in at a level of 58.5 versus consensus estimates for a reading of 56.8. The 1.7 point spread between the actual and reported number was also the biggest beat relative to expectations since the January report which was released on 2/5. 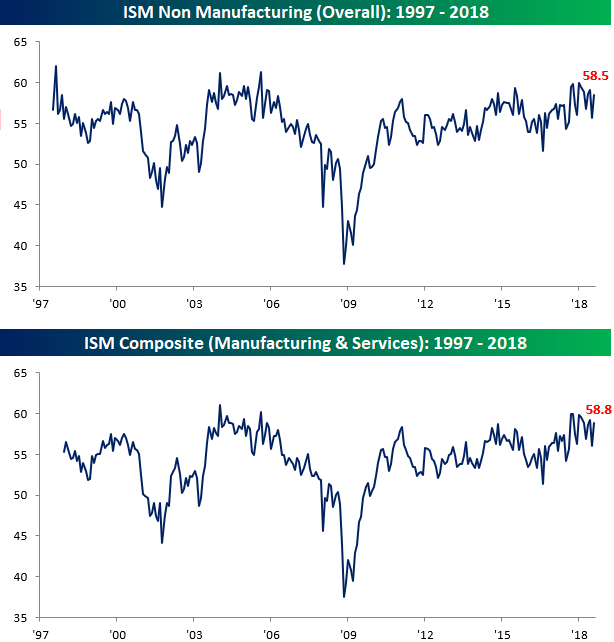 On a combined basis, accounting for each sector’s share of the overall economy, this month’s Composite ISM came in at a level of 58.8. For perspective, the peak reading in this index for the current period was 59.9 last September. The table below breaks down this month’s report by each of the index’s subcomponents. On both a m/m and y/y basis, breadth in the report was strong. The only two components that declined sequentially were Price Paid and Import Orders, while Inventory Sentiment was the only decliner relative to the same month last year. The biggest gainers this month relative to July were Backlog Orders, Business Activity, and New Orders.